As a blogger, you might need to share or add some quick information to your readers through PDF files or other documents like Spreadsheets, PowerPoint Slides, Excel Spreadsheets, Microsoft Words docs, etc. And if you are using Blogger platform for blogging like me, then uploading or adding PDF files or other types of documents is still not supported. 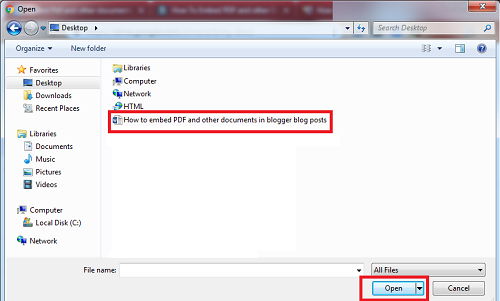 So, uploading documents or PDF files for Blogger users is not possible? Yes! It's absolutely possible using Google Drive. 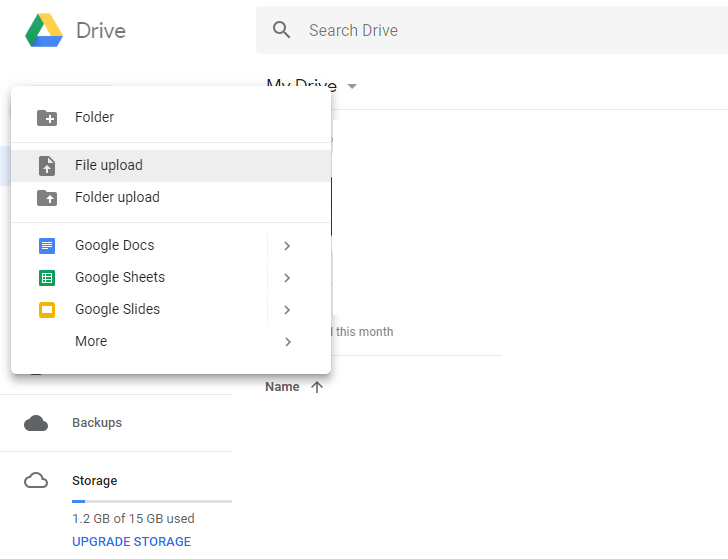 Google Drive is probably the most reliable and the easiest way to embed your PDF files and other documents on your blog posts, or on the sidebars. Google Drive offers you with 15 GB of free storage, and also has paid plan which is optional. You can upload your files and folders up to 5 TB in size and also can change the privacy settings for your private files and folders, including which files or folders or contents you want to make public. And Blogger has provided a feature through which we can edit our post on HTML codes and that makes us easier to embed PDF files or other types of documents rather than uploading the files and documents using Google Drive. Below is the example of this post that I have embedded using Google Drive. Step 1. 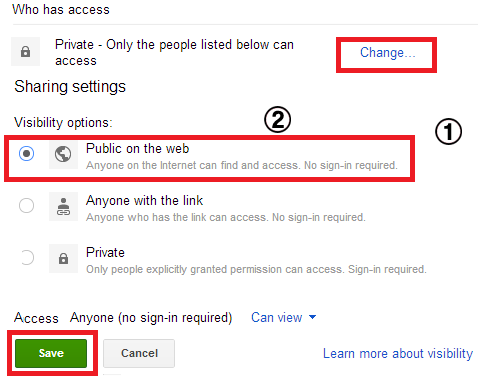 Go to Google Drive and Sign in with your Gmail or Google account (In order to have the admin privilege). Step 2. When you have signed in, click on New on the left-hand side and select File Upload. Now it will ask you to select the file which you want to share or add on your blog post. Step 3. When your file uploading is complete, click on the file name that you have uploaded. Step 4. Click on the more button at the top right corner of your screen and select Share and click on the Public on the web. 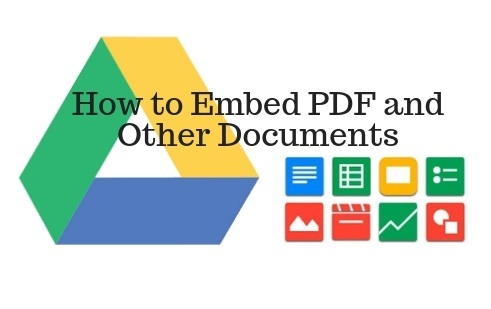 Note: In order to make your PDF document public you have to make your privacy setting public so that your readers could access your Google Drive documents. Otherwise, when your readers come to your post it will ask your permission to view your documents. Step 5. Then, select the more option and click on Open in new window button (At the top right corner of your screen). Step 6. Then, go to the new window and click on the more option and select Embed item... (At the top right corner of your screen). Step 7. On clicking Embed Item... you will get an iframe code. 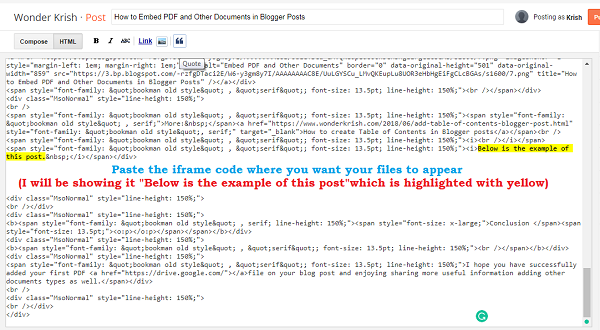 Copy the embed iframe code and paste it on your blog post. You can also customize or change the size of width and height according to your blog post page width. 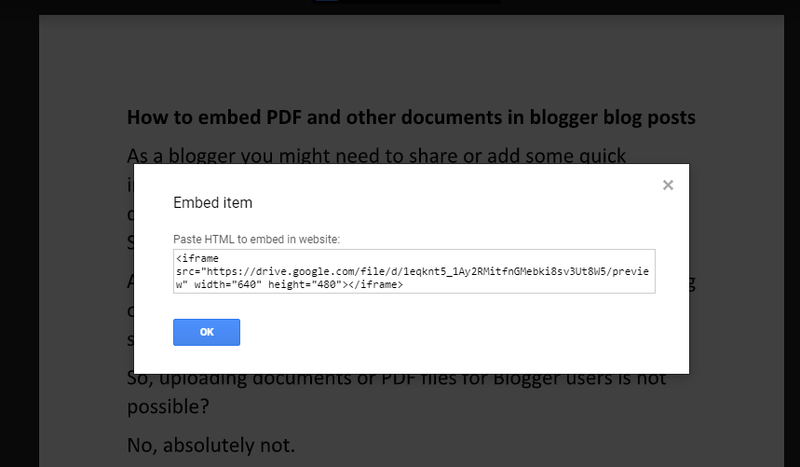 Note: While embedding the Google Drive’s embed code, switch to HTML mode and carefully search and paste the iframe code where you want your PDF files or documents to appear. I hope you have successfully added your first PDF file on your blog post and enjoying sharing more useful information adding other documents types as well.